With 5 individual jewelcases, packed in lp sized box including oversized booklet this set will bring you back to the old days of cd/vinyl packaging. Something deluxe. This exclusive 5 cd box set contains approx 5 hours of rare and unreleased material from the legendary 1968 NBC TV SPECIAL. Many for the first time available on CD. 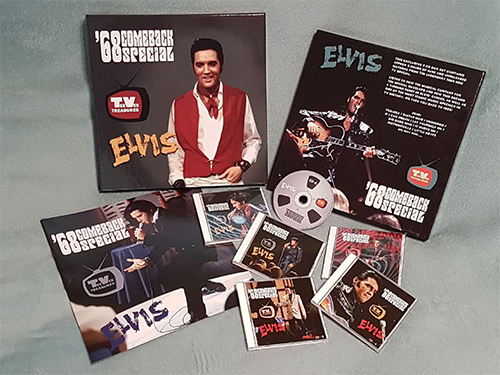 Listen to how the musical content for the special develops and how this became a turning point in Elvis’ career, as well as one of the most iconic music specials in TV history. We take you back to 1968! Hear: Trouble / Guitar man / Memories / If i can dream / Let yourself go / Big boss man / It hurts me / Nothingville / Little Egypt and many more. One-Hour Radio Special Which Premiered In August 2008 Celebrates The 40th Anniversary Of Elvis Presley’s ‘68 Comeback Special. I'm getting dizzy just by reading the track-list. And I think most others will also quit before reching CD 3. The unreleased material is not marked in any way. So, I assume it's a collection of what's available on FTD, Venus, the old bootleg LPs, the radio spots used by Tunzi before and a radio show circulating in some forums. The artwork looks really stunning. But I guess the material on this release is taken from other import and/or FTD cd's? On ebay I saw this for € 70,00 not too expensive, but if there's nothing new it really is. Does anybody know?